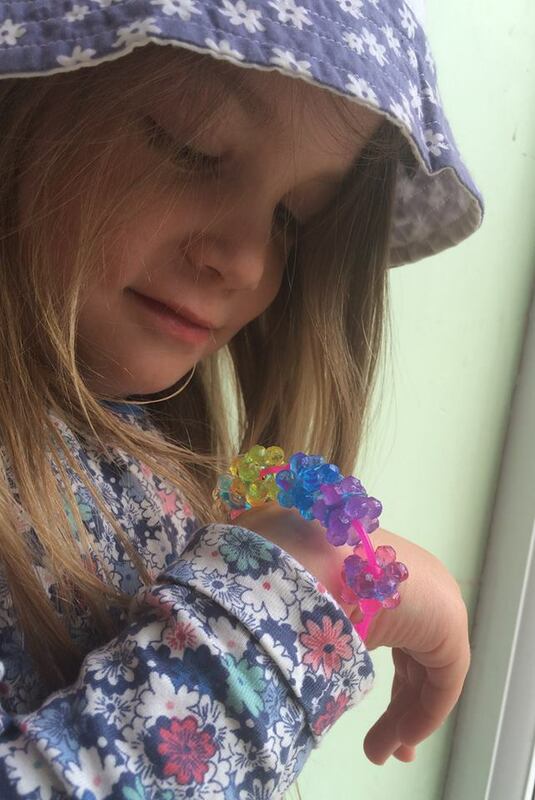 My four year old daughter loves pretty jewellery and is keen on threading colourful beads and making things to wear. 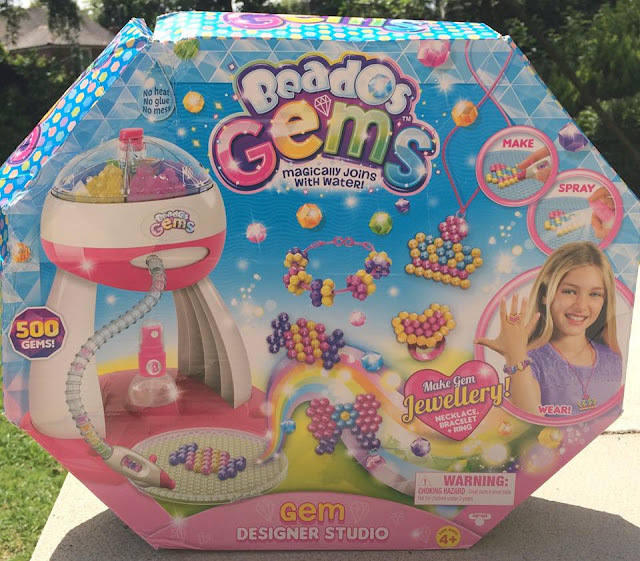 I've seen a few different jewellery making kits around but they all seem to be aimed at older children, so I was delighted to be sent the Beados Gem Designer Studio to review as it's safe and simple technique means that it is suitable for children as young as four years old. 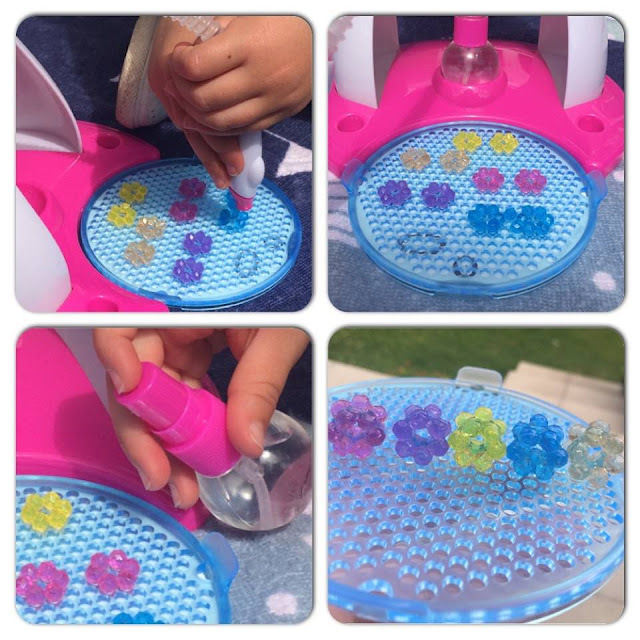 Beados gems join together with just a spray of water, meaning that no glue or heat is needed and they are safe and mess free for young children to get creative with! The Beados Gem Designer Studio provides a special six compartment storage for your gems which also allow creative little ones to select which colour to use, then use the attached Gem pen to place them onto the template which fits perfectly under the gem selector. The studio also comes with a variety of accessories to enable children to make a ring, necklace and bracelet. Elizabeth was very excited by the colourful packaging and wanted to get started as soon as the parcel arrived! After much deliberation of the six designs available, Elizabeth chose to make the colourful bracelet which involved creating 5 different coloured beads and bringing them together using one of the supplied accessories. The template fitted easily under the design tray and she selected her first colour in the bead selector and pressed the button on top to get started. This is where it started to get frustrating for her as she found the bead pen difficult to handle and aim and the beads seemed to regularly get stuck in the tube. I had to help her out and we eventually found it easier to just release the right amount of beads onto the tray and she would then move them into place with her fingers. Although the beads were small this was easy for her to do. 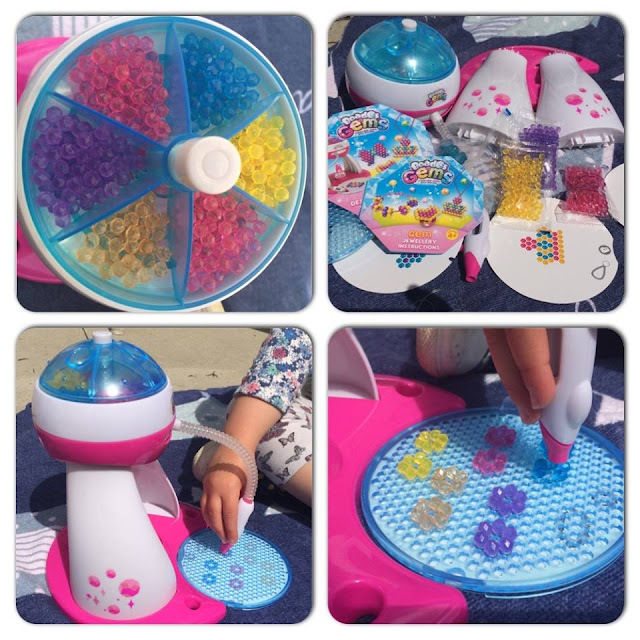 Once we had all the beads in place Elizabeth used the water spray bottle to gently squirt them with water then add the small circle discs, we had to leave them a while to dry before squirting again and placing the top layer of beads on to the discs. Once they were totally dry (around 90 minutes later ) we threaded them on to the pink plastic bracelet and Elizabeth has her very own colourful piece of jewellery made by her own fair hands. She was delighted with it! 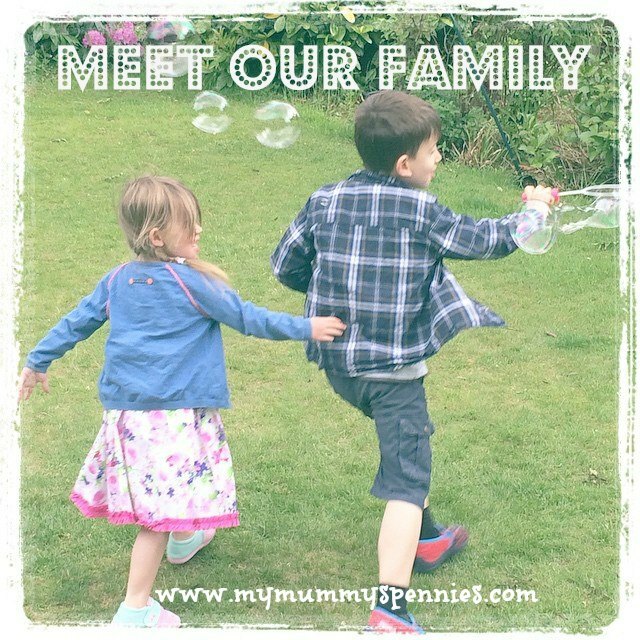 A great mess free activity that children will adore! Plenty of contents included for multiple uses and a selection of jewellery types to make. 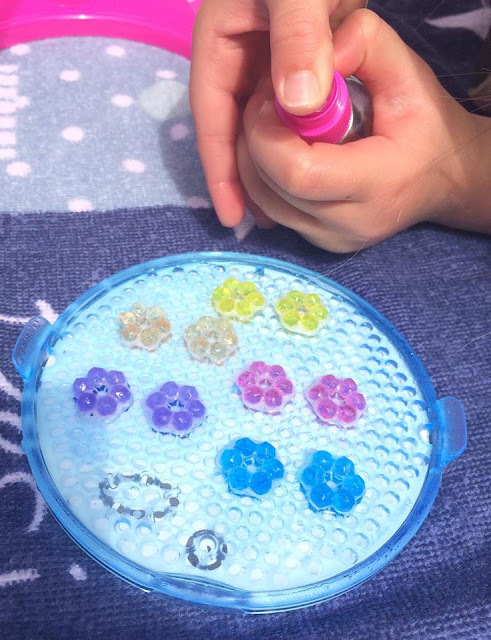 The 'studio' with the pen seems almost pointless and caused frustration for my daughter, I think she would have preferred just the beads and templates to create with her fingers. The RRP seems a little expensive for this set. The Beados Gem Designer Studio retails at £19.99 and is available at Character Online and Amazon. Overall I would say that this is a nice looking set that has plenty of beads and accessories for multiple uses and provides children with a good choice of designs to make. It is mess free and doesn't need glue or anything that would be dangerous for a four year old to use so allows children to create independently and make something pretty all by themselves. Although 'mess free' the beads are small and if not kept securely can get everywhere so be aware if you have younger toddlers or babies. I wasn't totally sure that this set was worth it's price however my daughter loves it and can't wait to get started on her next project despite some frustrations with the kit during this one. 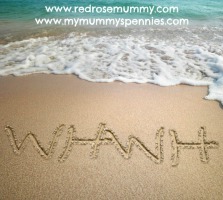 So for that reason I'd say it would be a good buy for a creative child aged four or above. This item was sent for review purposes, opinions and images are my own . 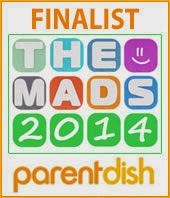 Post contains affiliate link.